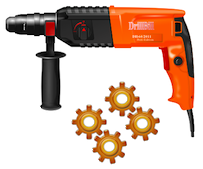 Keeping the garage organized is the key to finding the right tools and supplies when needed. You can’t just store everything in a box because then the wrench that you need will be right at the bottom. One way to have everything within easy reach is to mount the tools on the wall, keep the nuts and bolts in organizers, and put all the other things on shelves and in storage cabinets. 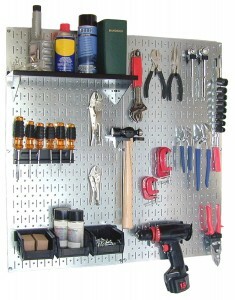 The galvanized steel pegboards by Wall Control are very durable and provide strong support for many tools. The Wall Control kit shown here includes two pegboard panels (32″ x 16″ each), a shelf assembly, three plastic bins with bin hanger, a screwdriver holder, a hammer holder, 15 assorted hooks and brackets, and mounting hardware and instructions. Additional accessories such as hooks, brackets, shelves, spray can holders, and paper towel holders are available. The panels also accept traditional common 1/4-inch pegboard pegs. The panels are easy to install with pre-drilled mounting holes on 16-inch centers. A built-in frame flange provides ample hook clearance and full access to all holes without requiring additional framework. Wall Control has a few other organizer kits, as well as just a set of 2 panels without any accessories. 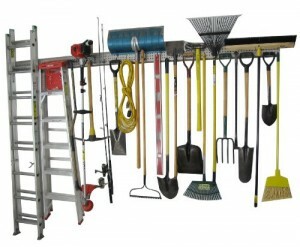 Another option for hanging items such as ladders, shovels, rakes, axes, etc. is the steel rail by Holeyrail. It comes in two sections of 4 feet each with all the mounting hardware. The sections don’t need to be mounted adjacently. It uses standard peghooks (sold separately) and comes with 10 pegstrappers to hold the hooks in place. The rail is USA made and can support up to 600 pounds. 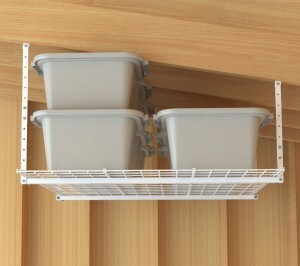 This small stuff organizer is good for storing many household items and keeping them away from the dust. The clear lids are not individual but one per row. When open they can be locked in place which is very convenient. They also lock when closed to prevent spills if the organizer is free standing. In the garage the organizer can be mounted on the wall for storing nuts and bolts. The bins are 5″ deep and 4″ wide. The organizer is 14.4″ wide and 18.5″ tall. Although the name implies that this is stackable, it is not (Stack-On is just the name of the company). There are other types of Stack-On organizers as well. All are of very good quality and are efficient in their design. If there is enough room in the garage the wall shelves are an easy storage option. 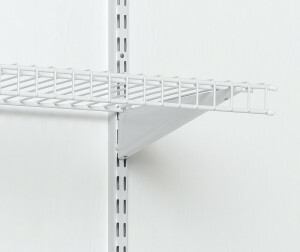 HyLoft makes powder coated steel shelves in two sizes: 45″ x 15″ and 48″ x 24″. They come in sets of two and each can hold up to 150 pounds. The shelves are easy to install with the included mounting hardware. Just be sure to mount the support brackets on studs. Another system for shelves is offered by ClosetMade. As the name implies these shelves are designed for use in the closet but if you are not planning on putting heavy power tools on them they should be fine in the garage. We have all our garage stuff, such as suitcases, bins, cans with paint, etc. on these shelves. You can buy separately the shelf tracks (pictured here and offered in 12″, 30″, 48″, 60″ and 84″ length), the hang tracks (in 40″ and 80″ length), the locking brackets (12″ and 16″), the shelves (48″x12″, 72″x12″ and 72″x16″), and the mounting hardware. The hang tracks are optional and are used to attach the shelf tracks for additional support. ClosetMaid also makes all of the above parts especially for garages. The product line is called Maximum Load but unfortunately it is not available on Amazon. You can check your local Home Depot or get them directly from ClosetMaid. When there is not enough space in the garage for shelves the ceiling offers an option for storage. This HyLoft overhead storage can hold up to 250 pounds. It measures 45″ x 45″ with adjustable ceiling drop from 16″ to 28″. The mounting equipment and the shelf are included. 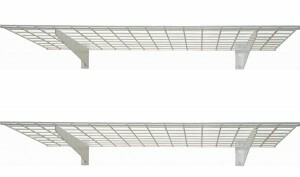 HyLoft overhead storage systems in different sizes are also available. 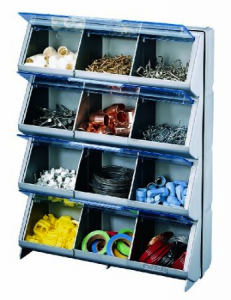 The Prepac Elite Collection of heavy duty cabinets is ideal for garages. There are large storage cabinets, broom cabinets, wardrobe cabinets, wall cabinets, and more. See the full collection here. We inherited two of the large cabinets from the previous house owners and cannot be happier with them. They are made in Canada and are of very good quality. Constructed of laminate composite wood and weighing more than 70 pounds they are very sturdy. We had to disassemble and reassemble one of them to move it out of the utility room to the garage. Although it was one person assembly, two people were needed to put the cabinet in an upright position. The cabinet pictured here measures 32″W x 16″D x 65″H. It has 3 shelves, two of which are adjustable. There are a few other options for garage cabinets. 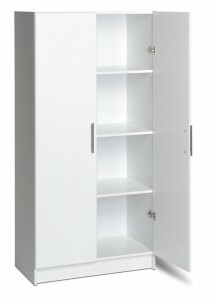 Sterilite and Suncast both offer resin/plastic storage cabinets. They are certainly cheeper options but not as sturdy as the wooden ones. Steel cabinets are made by Gladiator, Sandusky, Seville Classics and Tennsco. They are sturdy but many people complain that they received them dented. We have decided to open our POWERFUL and PRIVATE website traffic system to the public for a limited time! You can sign up for our UP SCALE network with a free trial as we get started with the public’s orders. Imagine how your bank account will look when your website gets the traffic it deserves. I have shelves in my garage and for a long time wanted to remove them and put something like a closet. I like the look of this prepac white cabinet. Do you know where I can find it in stores? I am not sure but you can try IKEA. Ours were left by the previous house owners and they were big fans of IKEA. I have so much junk in my garage. I need someone organized like you.